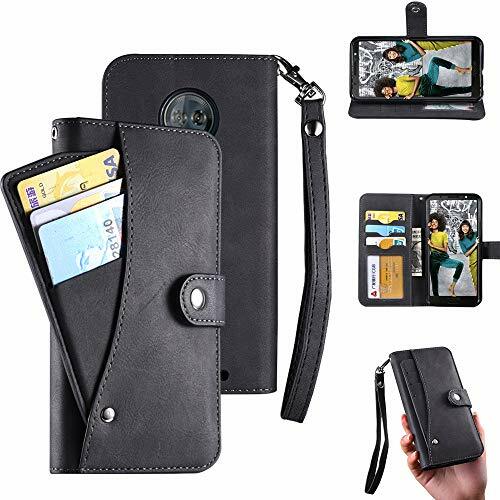 Moto G6 Plus Case,Moto G6 Plus Wallect Case, Flip Leather Case 5 Cards / 1 Photo Slot/Cash Pocket PU Cover with Wrist Strap [Wallet Stand] Phone Case for Moto G6 Plus (Black) by okasis at Got Busted Mobile. Hurry! Limited time offer. Offer valid only while supplies last. [Material]Moto G6 Plus Wallet Case is Made by High Quality PU Genuine Leather Which Reach Notional Environmental Level.It have Good feeling ,Duarable ,Comfortable. [ Funtion]The case Have multi-functional.Built-in Card Pockets & Sleeve conveniently store your ID, license,photo,cash and credit cards.even the back cover can stick on car mount base very steadly.enver mind it slip. [Suitable for any person to use] the Stlye of the case can be Suitable for Ladies Girls Women Boys Men, User friendly design with precision cut-outs allow easy access to all buttons, camera, speakers, and connector without removing the case. [Easy to clear] this Case not only provides protection against daily wear and tear, scratches, marks and scrapes,but also it is very esay to clear, only using wet clothes or Tissue can clear very well. [View from any Angle] Self-Stand functions provide easy enjoy while reading and watching movies with your Phone.Color maybe slightly different from actual item due to photographic lighting sources or your monitor display settings . If you have any questions about this product by okasis, contact us by completing and submitting the form below. If you are looking for a specif part number, please include it with your message.